The number of British people who do not support economic boycotts of Israel has soared over the last year, according to exclusive new polling. A new Populus poll has revealed that 51 per cent of people “do not boycott Israeli goods, and find it difficult to see why others would single out Israel given everything else that is going on in the world”. This is up eight per cent compared to last year’s survey. 56 per cent of people agree that a boycott hurts both Palestinians and Israelis and this has increased by nine per cent since October 2015. Britons are also more than twice as likely to agree as disagree that hating Israel and questioning its right to exist is antisemitic. 48 per cent of people believe that it is antisemitic, while only 20 per cent believe that it is not. 57 per cent of people however agree that just criticising Israel is not antisemitic. 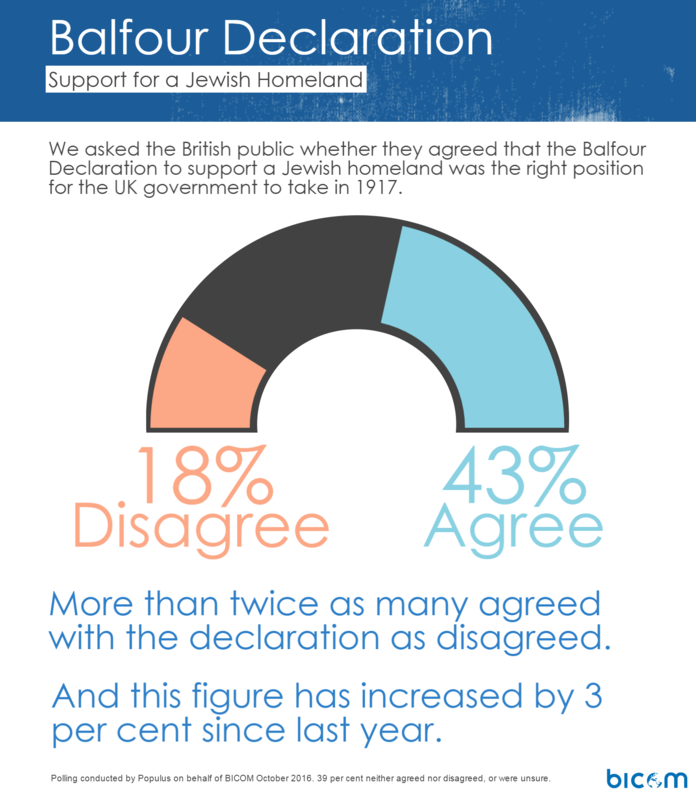 There has been an increase in the number of people agreeing with the British policy in 1917 to support the creation of a Jewish homeland, as expressed in the Balfour Declaration. The finding is especially revealing given that the document approaches its centenary in 2017. 43 per cent say they agree with the policy, up from 40 per cent the year before. Israel is still considered to be Britain’s strongest ally in the Middle East. 57 per cent of Britons regard Israel as an ally of Britain in the Middle East, up from 52 per cent from October 2015 and the highest figure for countries in the region. 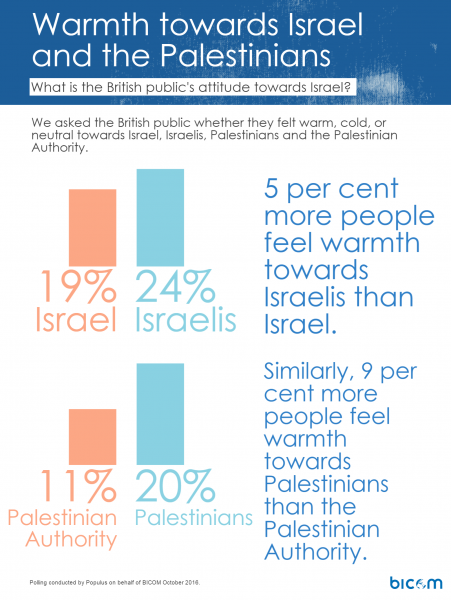 Overall British warmth towards Israel remains stable at 19 per cent, while British warmth towards Israelis is at 24 per cent. This is in comparison to 20 per cent warmth towards Palestinians, and 11 per cent support for the Palestinian authority. 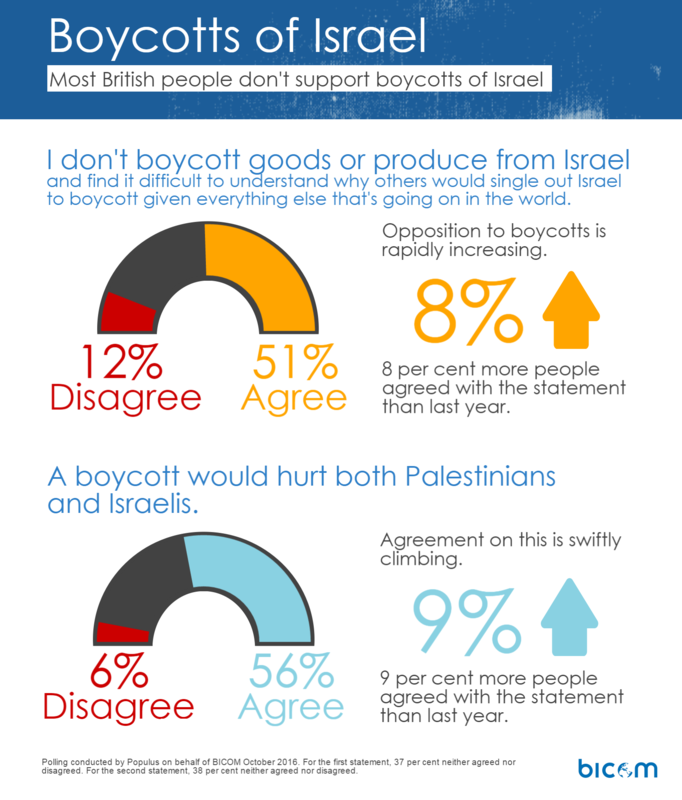 “Our poll show a very significant shift against the idea of boycotting Israel. The majority opposing it has increased by as much as eight per cent over the past year. The British sense of fair play is a clear theme in the poll as time and again respondents reject singling out Israel, given everything else going on in the world. “In a year where we have seen several public figures attempt to explain their hatred of Israel as a political position, the judgement of the British people is stark. They clearly understand that hating Israel and questioning its right to exist is antisemitism, pure and simple. The number of Britons who regard Israel as an ally in the region has increased. 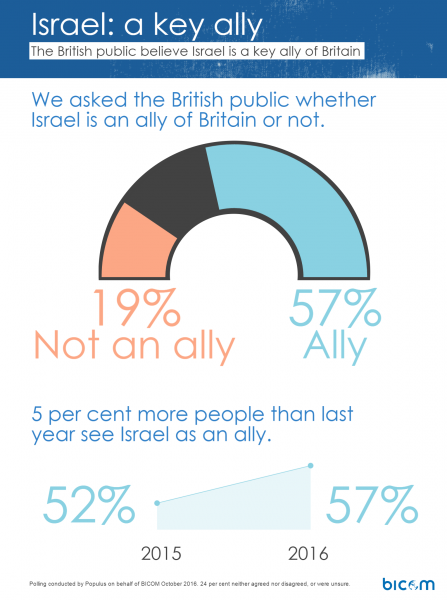 57 per cent now say that Israel is a British ally, compared to 52 per cent in 2015. 51 per cent of people would not boycott Israeli goods, and find it hard to see why others would single out Israel given everything else that is going on in the world. This is up eight per cent from last year, when 43 per cent held this view. 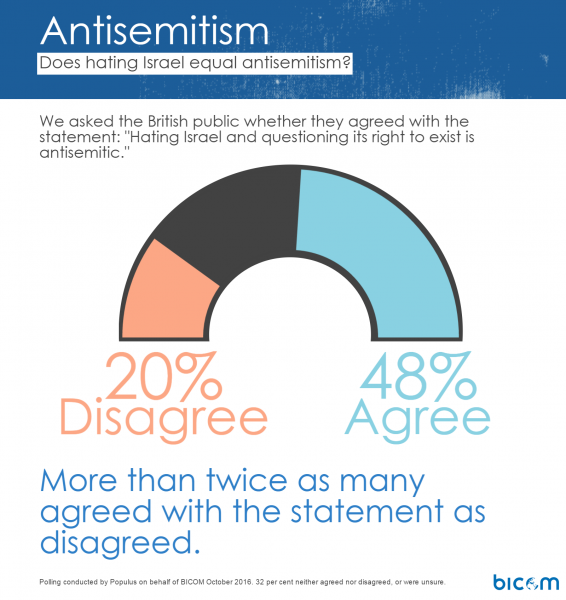 48 per cent of people believe that “hating Israel and questioning its right to exist is antisemitic”. This is more than double the 20 per cent of people who believe that is not antisemitic. 19 per cent of Britons feel warmth towards Israel, while British warmth towards Israelis is at 24 per cent. This is in comparison to 20 per cent warmth for Palestinians, and just 11 per cent warmth for the Palestinian authority. 43 per cent of people support the Balfour declaration that indicated Britain’s support for a Jewish homeland in Palestine in 1917 up from 40 per cent the year before. ISIS is seen as the greatest threat to both Britain and Israel. 75 per cent think the terror group is a threat to the UK, while 60 per cent think it is a threat to Israel. Hamas is considered a threat to Britain by 15 per cent of respondents, and Hezbollah by 14 per cent of respondents. 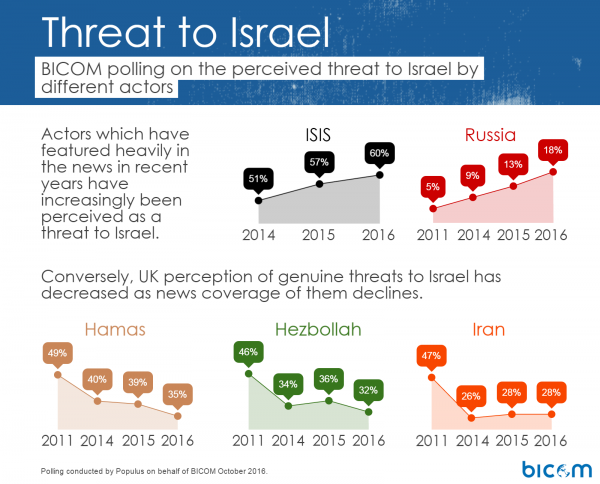 This numbers more than doubles to 35 per cent and 32 per cent respectively when respondents are asked if Hamas and Hezbollah are considered to be a threat to Israel.